In December 2017 Humphrey School's Associate Coordinator of the Humphrey International Fellows Program and MPA alum Pepe Wonosikou hosted a series of events with alumni of the Hubert H. Humphrey Fellowship program in anticipation of the 40th anniversary of the program (https://www.humphreyfellowship.org/about-program). 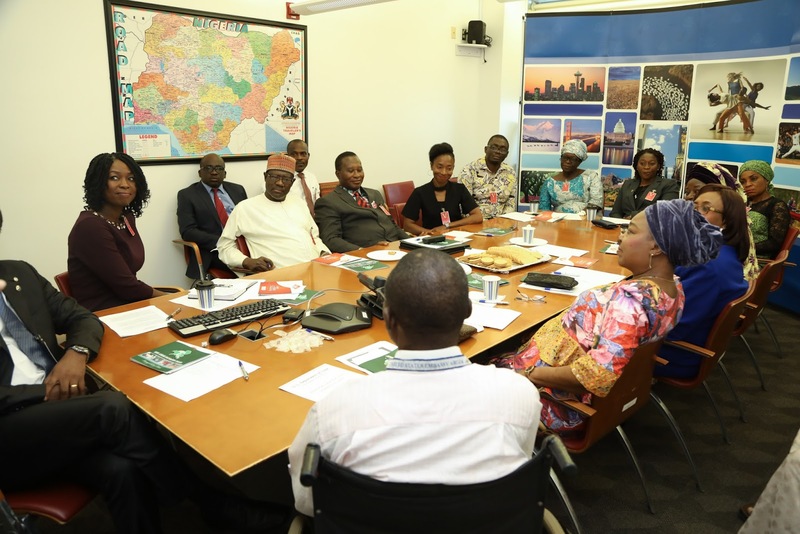 With the support of the US Embassy in Abuja, she held an alumni reunion coffee and then traveled to Lagos to meet members of the Fellowship Alumni Association. Discussions were videotaped and will be available later. Lagos state, the cultural and economic capital of Nigeria, is a bustling, vibrant metropolis of 21 million people. Since May 2015, it has been governed by Akinwunmi Ambode, who by all accounts, has led the city through a time of growth, and has been lauded for his exceptional leadership. Governor Akinwunmi boasts an impressive resume, having studied at the Wharton School, and Harvard’s Kennedy School of Government. Alongside his experiences at these stellar schools, he credits another experience in the United States with equipping him with the tools needed to do his job. In his words, "The Humphrey Program afforded me insights into ways that leadership can be both effective and selfless. It equipped me with the various tools I needed, and deepened my resolve, to effect positive change everywhere I went, in every office I held, and with virtually everyone I know ... That is the perspective I gained during my Fellowship year in Boston, and it has become like a light that still burns brightly within me to this day." Almost everyone mentioned the cohort model as a highlight of their experience, which allowed them to form lasting personal and professional networks, and most importantly helped them learn how to work effectively with people from diverse backgrounds. The alumni were energized by our discussions of the 40th anniversary of the Fellowship program and the possibility of partnering with the more active Lagos alumni chapter to plan a countrywide event. One of many positive outcomes of the alumni event in Abuja was that the group appointed an officer to help establish a stronger alumni network and partner with the Lagos association on projects. 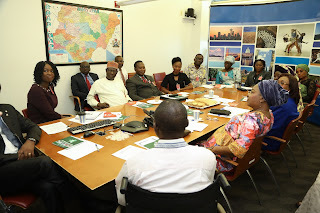 The Abuja event also included 7 prospective applicants who had the opportunity to learn about the program and its impact, and to establish local networks of professionals with expertise in similar fields. Inviting prospective applicants provided a forum to leverage and share the knowledge Fellows acquired during their Fellowship as well as serve as a resource to young professionals. Stories like Governor Akinwunmi’s abounded at the alumni events and interactions I had in Nigeria this past December. Beginning with a group of 11 alumni who attended the event at the U.S. Embassy in Abuja and culminating with the Humphrey Alumni Network in Lagos, I had the opportunity to hear and witness first hand, the great work that alumni are doing to build and develop their communities. The Abuja event brought together a diverse group of dynamic and highly accomplished Nigerian alumni working across disciplines to address some of Nigeria’s most pressing issues in public health, education, economic development, journalism, human rights, public policy and education. They all shared incredibly moving stories of their Humphrey Fellowships experience and how it transformed their lives and careers, helping build their skills to propel them forward and upward in their careers. During my time in Lagos, I also met with officers of the Lagos Alumni Association. 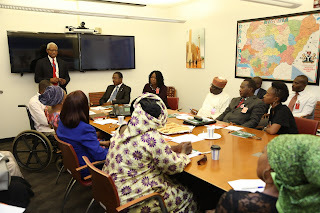 This meeting provided an opportunity to meet alumni who were unable to travel to Abuja for the Embassy event. It also gave me the opportunity to meet a different demographic of alumni working on a unique set of challenges in their regions of the country. The Association is very active and hosts a myriad of professional development events and workshops for alumni of the Humphrey Fellowship and other US government-sponsored fellowship programs. They mentor and advise other alumni and prospective applicants, and serve as a resource to young professionals in their communities. We had engaging discussions about current political, economic, and social trends in the country, and how our generation can be at the forefront of the needed change to transform our societies. As a Northeastern Nigerian, I was particularly interested to hear about development challenges facing their part of the country and how similar and paradoxically different they are from those in my part of the country. In Adamawa State, violence stemming from the activities of Boko Haram, coupled with cultural and religious beliefs have created unique circumstances that leave us mired in underdevelopment in all sectors. During my time in Nigeria, the state was embroiled in a series of attacks and counterattacks that left entire villages burned to the ground and entire populations displaced. It was jarring to meet alumni in Lagos and realize how removed they seemed to be from the events up North, and I welcomed the opportunity to sit with my fellow Nigerians and share these realities with them. I appreciate the Humphrey Fellowship Program in a new way because of this opportunity– I may never have met these dynamic fellow countrymen had it not been for my involvement with the program. All participants in the events agreed that it is imperative to form a stronger network of alumni across the country to extend and maximize the impact of their work and leadership. A stronger alumni network will also go a long way in aligning the work in which alumni are engaged, and create more opportunities for collaboration. The officers of the Lagos Association are working with a representative of the Abuja alumni to forge stronger ties.